I’ve ridden in some pretty scary situations. I think the forty miles of snow back in 2004 is up there, closely followed by that snowy pass in Yellowstone and the endless gravel construction zone in 2005(?). The two miles on that muddy dirt road eclipses them all. Those with plenty of dirt experience are probably pooh-pooh-ing right about now. Mud isn’t a big deal, right? Well, try it a few 1000 miles from home on a big heavy expensive touring bike! I was in no hurry this morning, trying to give the road time to dry off. Scott and his mom were following me in the mini-van to make sure I had help if needed. The first part of the road was mostly dry. I started out slowly but with a little confidence. I kept reminding myself to stay loose and look ahead. I made it through the first little mud patch, but the rear end slid around and my feet went down reflexively. After a deep breath I continued, that familiar sick feeling in my stomach. In the second mud patch, the bike went right, went left, and went down. Scott jumped out of the van and helped me off. I wasn’t injured and the bike didn’t appear to be damaged, but I knew that this wasn’t going to work. After indulging in a nice little panic attack, I helped Scott pick up the bike. It was resting on the cylinder head and saddlebag, so not completely over, but the wheels kept sliding sideways in the mud. We took another break once it was upright and then began the slow process of pushing it the remaining mile or so to the paved road. I don’t do well in bike-push situations (understatement). My sense of balance disappears and a constant fear of falling over manifests. We took frequent breaks and experimented with different speeds. I kept the ignition on to have access to the power brakes and tried to ignore the gnawing fear that the battery would be drained by the time we made it to pavement. The 6″ deep sucking mud ruts finally gave way to graveled dirt. We rolled onto the chip-seal and parked the bike. 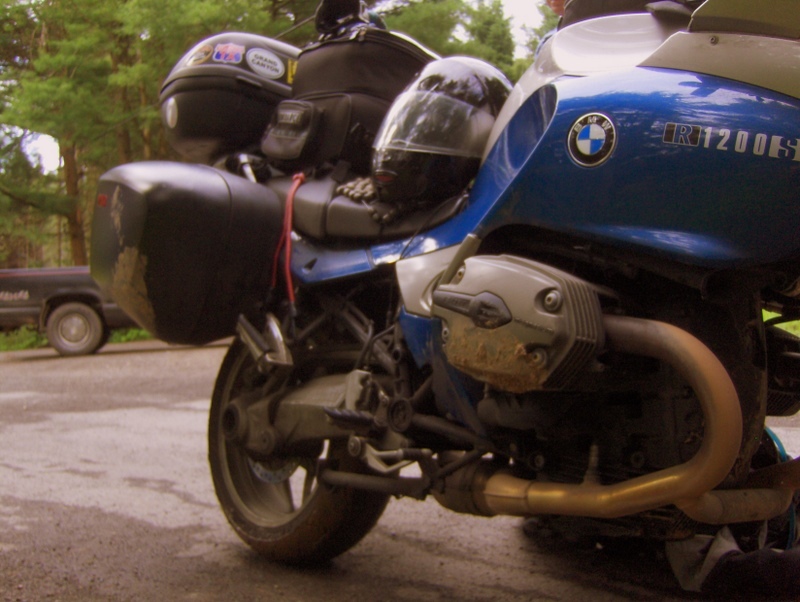 I stripped off my riding gear to dry off and catch my breath while everyone admired Scott’s muddy boots. 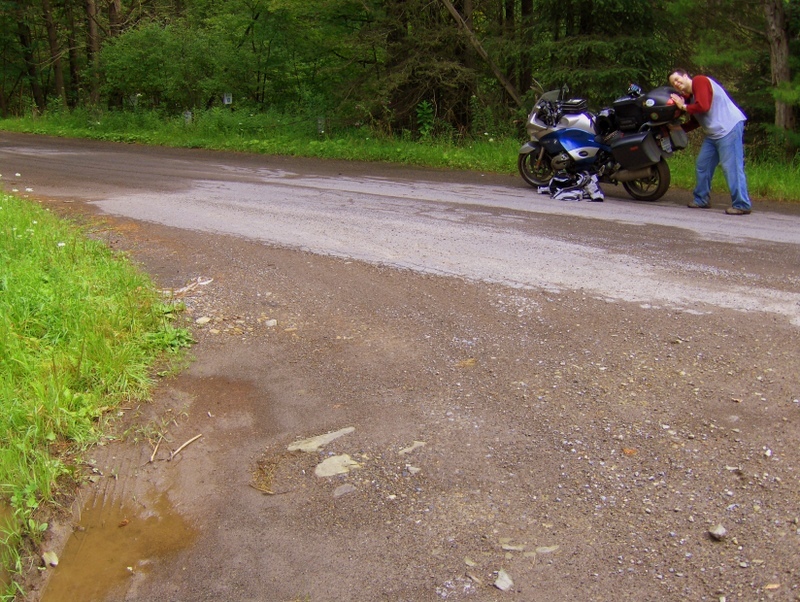 A passing neighbor expressed astonishment that we’d gotten the motorcycle through the road. After good-bye’s and profuse thank-yous, I started up the ST and shakily rode off. I’ve found in the past that after a scary experience, it takes me a while to relax into the road. 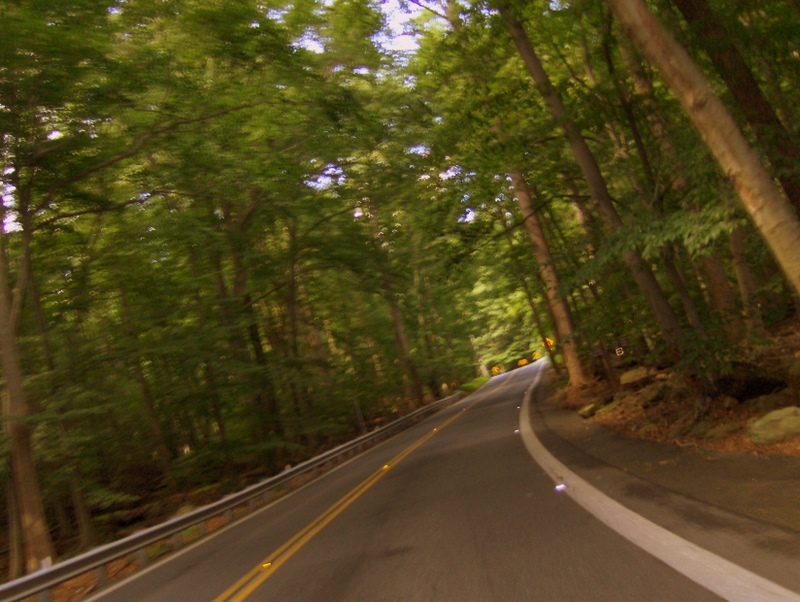 The steep pass over PA-487 through Ricketts Glen would normally be a fun experience, but I was too stressed out today. 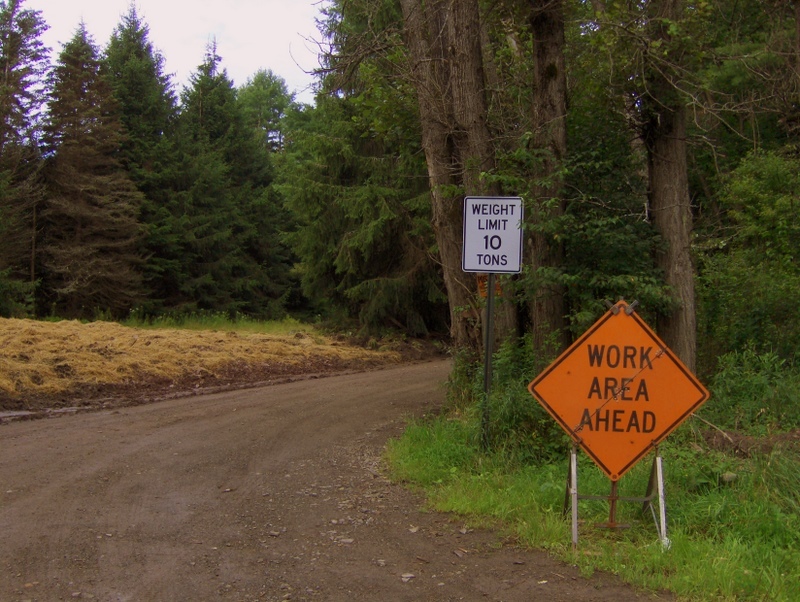 Orange construction signs on the Pennslyvania roads made me instantly tighten up. Happily, I encountered nothing more serious than loose gravel on chip seal. In Sunbury, I treated myself to some iced coffee and a break before once again riding along the Susquehanna. 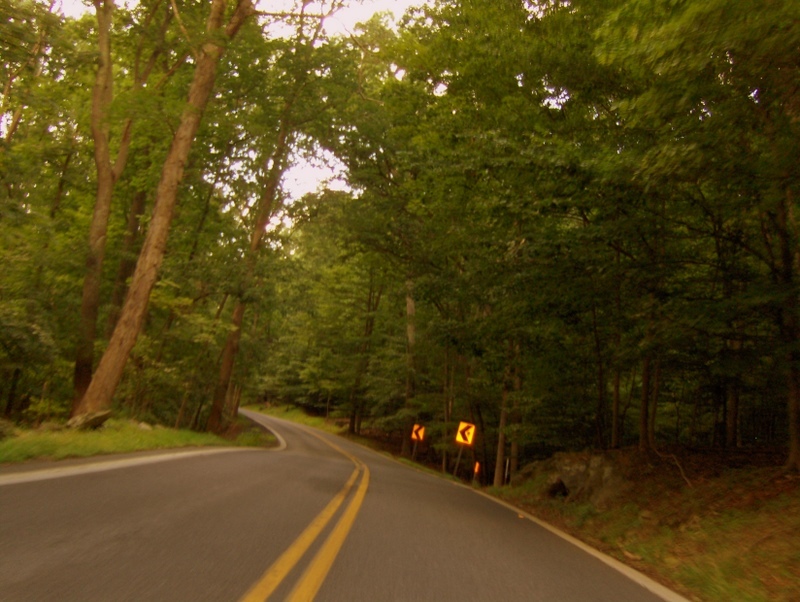 I finally began to relax and enjoy myself riding through Catoctin Mountain Park near Hagerstown, MD. There was scenery, curves, and lovely sunlight filtering through the canopy of trees. I love stopping at historical sites. 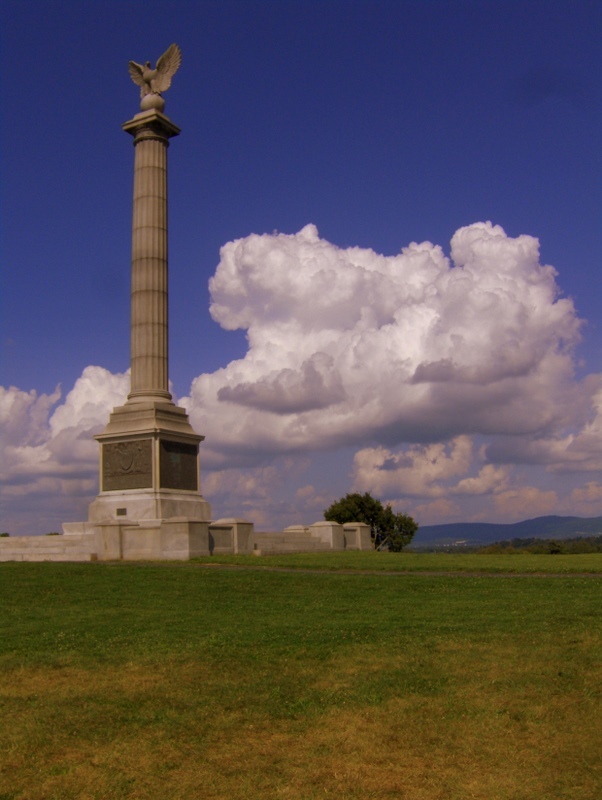 Earlier in the day I’d passed through Gettysburg and had been torn over whether to explore the battlefield (had visited on a family vacation several years ago). 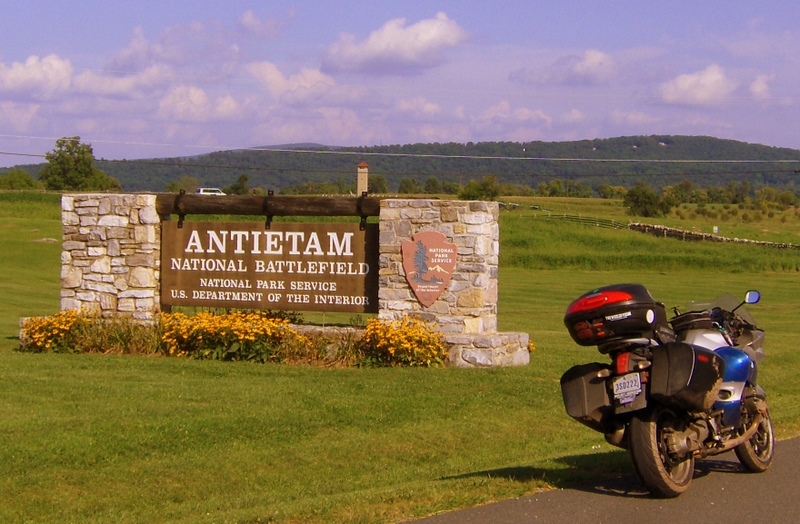 I ultimately decided to skip the already-been-there Pennsylvania battlefield in favor of a visit to Antietam in Maryland. I had originally planned to camp that night in Shenandoah National Park, but found myself checking into a hotel in Front Royal, VA late in the day. I was aching for air-conditioning and just couldn’t face the additional 50 miles to the campground (assuming it would take hours on slow national park roads). 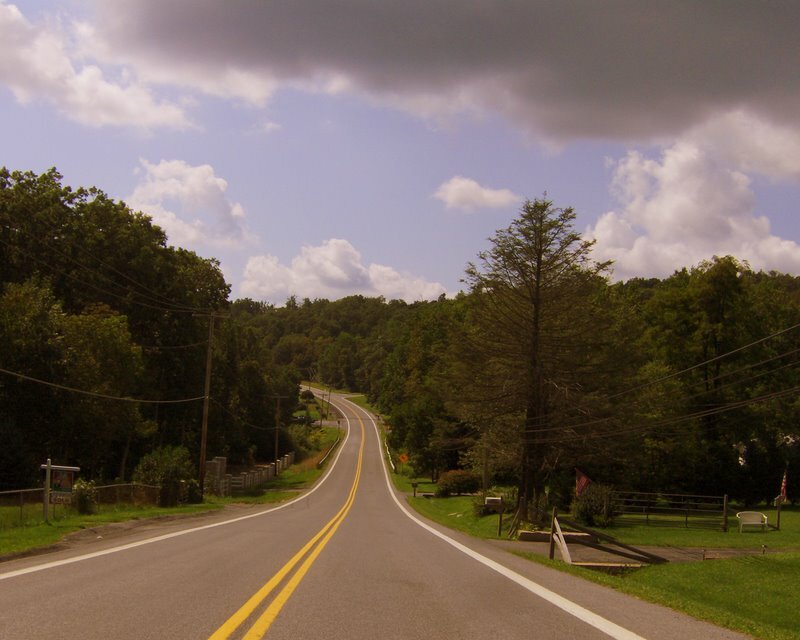 This entry was posted in PA09, Trip Reports. Bookmark the permalink.